Availability: Usually ships in 3 to 4 weeks. 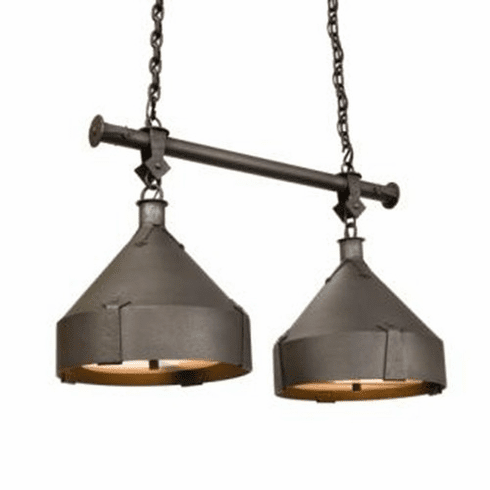 This Spanish Revival Anacosti Trulli Linear Suspension is available in several finishes. The picture shows old iron finish. The light is 18inches high, 12inches wide, 32inches long with a 4 foot chain. It uses two 100 watt bulb. Please allow 3 to 4 weeks for this item to ship as each is crafted-by-hand and made-to-order with the specific finish option chosen by the client, one at a time. Therefore, returns are only reviewed for approval on a case-by-case basis. In compliance with Underwriters Laboratories, all fixtures designed for permanent placement (direct wired or hardwired) MUST be installed in accordance with the applicable installation code by a person familiar with the construction and operation of the product and the hazards involved. The support structure must be evaluated to ensure it will withstand the weight of the fixture (such as chandeliers).